The Midnight Review: Quote Quiz! Mitt Romney Or Barack Obama? "Did I ever say something strikingly similar to that which I will criticize today?" Who Said It? Mitt Or Obama! Being that there are only two questions, you can grade yourself! "I don't think you change Washington from the inside. I think you change it from the outside." "You can't change Washington from the inside. You can only change it from the outside." What is the purpose of this quiz? 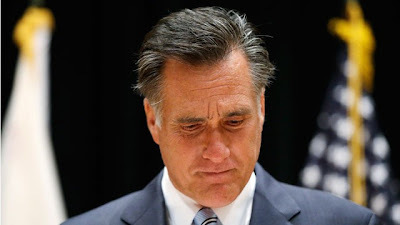 Desperate after a disastrous week of broken promises, flip-flops, and secret recordings, Mitt Romney has been trying very hard to change the subject by trying every play in the book. Romney has done everything, from reaffirming his comments from the secret video recordings, attacking a 14-year-old "secret" video recording of the president (where he says nothing outrageous or secret), and most recently picking up on a comment made by the president and using it to attack the president despite saying the same exact thing himself, hence the above quiz. Can Mitt Romney's week get any worse or will he provide us with another gaffe to lampoon? Update - It appears that Romney was extremely desperate and released his incomplete tax returns a month early to change the subject!